A look at some of my posts about this movie (mere updates about the movie's progress) show a torrent of comments from young'uns asking for information on auditions and explaining their suitability for a certain role, based on their own affinity with the character and physical resemblance. I thought it was quite touching. When a favorite book is tapped for movie-dom, it validates the fan's interest in the story and the characters which is why these silver screen offerings are anticipated so eagerly. The one thing fans ask of the director is "don't mess up." Chris Columbus is NOT a brilliant director but he can get a movie done in workman like fashion. His first two Harry Potter movies were fairly faithful and straight forward tellings of the tale. It took director, Alfonso Cuarón to lift the series and the actors' performances to the next level and in many ways the series has been running on that energy ever since. What Columbus lacks in artistry he makes up in his ability to steer a movie across the finish line while not annoying fans of the books too much. I enjoyed Percy Jackson & the Olympians: The Lightning Thief . The actors performed with great earnestness. Special kudos to Brandon T. Jackson as Grover, who was able to shape his lines with just the right tone and flair and humor. The BEST part though was standing in line for popcorn before the movie and taking measure of the types of people there on a chilly Saturday afternoon. The weekend before, Treebeard and I had gone to see Crazy Heart and I was amused to see the lobby of the theater OVERRUN with teen girls, all streaming in to see Dear John. This day the boys were there in force. Like that perennial boy-favorite book, Go, Dog. Go!, there were big boys, small boys, skater boys, video game boys, soccer players, football players. Boys wearing glasses, boys wearing caps, tall boys, short boys, young boys and old boys and they were all headed for the same theater I was. It could have been a Halo or World of Warcraft convention. The theater was sold out and this was a week after the movie had opened. We had to move up very high to find two seats together.Our seating choice also placed up next to two young men who spent the movie quietly but intensely commenting and the things that were different and the same as the book. I have to say, it made me smile. These two had to be at least, juniors in high school and there they were, having an ongoing sotto voce conversation about a book, comparing and contrasting. I hope they do as well with Mark Twain. School visits are NOT for the faint of heart. Veterans of the school visits have good advice to offer on the subject. Kelly Milner Haas has collected a page of pointers from authors that is well worth your attention. As a school librarian, I have my own ideas on what makes a successful visit so I offer these as you embark on this odyssey. Getting on school librarians' radar may require some volunteer/free appearances in the beginning, some face time at state library association conferences (SCBWI booth, or other groups) or making personal contacts. Experience and polish pay off. Begin where you can, the PTA, your child's career day, volunteer to be an I Love to Read week reader if your local school district has opportunities like that. DO keep your website UP TO DATE and make sure your contact information is easy to locate. It should not take more than ONE mouse click to land on your "contact me" page. DO prepare an invoice ahead of time to send to your contact at the school so they can start the paperwork to pay you for your visit. You may have to fill out some forms for their business office. Despite your best efforts and the librarians', the accounting dept. does cause delays sometimes. It is proper to expect your payment at the time they arranged with you, either the day of the visit or at the end of the week. DO know that you may be "Raptor-ed." You will need a driver's license or other official ID with you. If there is any reason to think your name is going to show up on a list that might make you school toxic, you should rethink the school visit idea. DO keep your ID badge on during your time on campus. Even Famous-Author-Persons will get stopped in the hallway if they are not wearing proper school identification. DO realize that you CANNOT SMOKE on school grounds. DO ask, in case they forget to tell you, where the bathrooms are located. DO remove or TURN OFF any wireless microphones before visiting the restrooms. My campus was home to a unit for hearing impaired students. Those kids probably hear some interesting things when folks forget to return their hearing aid microphone to them. DO verify that you will have a break for lunch. If you are at a campus all day you will need sustenance. Sometimes the librarian will order food from a local place or take you to lunch (it is a chance to get out of the building for them too) or offer you the bounty of the school cafeteria. I've heard of some schools where you are on your own. If you live locally, consider bringing your lunch. DO know that it is OK for you to ask for some time to rest your voice and recharge during your breaks. Librarians and parents and teachers are so excited to have you on campus that we pepper you with questions and engage you in conversation. We teach all day. We understand the need for some vocal down time. DO have some water with you just in case. It should be provided but if they forget, it is ok to ask for some. DO keep your presentation to 30 minutes for young kids, k-2. It can stretch to 45 minutes for older kids or as necessary. DO let the librarian know ahead for time if you use props, copies of your books, posters, slide shows, drawing pads during your presentation, so they can have easels, tables, projectors already set up. Ponder a Plan B in case of technology failures or equipment malfunction. It happens. DO make eye contact, wave and acknowledge the audience as they come in. On the other hand, suddenly appearing from behind the curtain can be exciting and build anticipation too. DO NOT assume the teachers or librarians are complete control of the kids. Most teachers are conscientious about monitoring their students' behavior but it never fails that the one kid they need to make SERIOUS eye contact with will be in the middle of a sea of faces and unreachable, vocally, physically or telepathically. YOU, Famous-Author-Person CAN smile and tell the kids to sit down, and stop talking, and to keep their arms, hands, fingers, and feet to themselves, and ask them not to lean on their neighbor or untie their classmate's shoelaces. Point out specific kids who are doing a great job. Kids will snap to attention if there is potential for recognition. DO understand that the moment you announce 'question-answer' time, a sea of hands will launch skyward and begin waving towards you with urgency. a. Some children put their hands up without any idea of what they are going to say. Tell them you will come back to them when you get their "Uhhhhhhhhhhhhhhhhhh..." that is going nowhere after you call on them. b. Some children FORGET that they even have their hands in the air and will sit with their arm up until kingdom-come unless someone tells them "hands down." c. It is AOK for YOU, Famous-Author-Person to tell them to put their hands down while you present, talk, sing, dance. You are on a schedule. They don't understand that. Also, it is just nice manners to listen to the answer to a question without waving one's arm around in hopes of being the next one called upon. DO anticipate that you WILL be asked "where do you get your ideas from" and "how much money do you make?" I always threatened warned my students about asking these questions but there is always one. DO watch the librarian for cues on which kids to pick for questions or activities. They might know which child needs the "face time" and recognition from you for personal reasons. DO know that you will be asked questions like "I have a puppy" or "my brother threw-up last night." DO NOT under any circumstances, start signing autographs at the end of your presentations. You will be crushed beneath the onslaught of humanity as kids shove their hands, arms, foreheads, shirts and stinky shoes at you to sign. Their teachers will valiantly try to restore order but it may be too late for you. Your broken body will be found flattened on the floor. The librarian can create a page of bookmarks for you to sign and they can be copied for everyone. Yes, the kids know it is not the same. At the end of your wonderful presentation. the warmth of your personality may move some children (especially young ones) to want to hug you. If one child gives you a hug, then they all will want a hug. and ... well ... see above for the perils of autograph signing. It is AOK to keep a zone of personal space around you. It is entirely appropriate to thank a child for offering their hugs but then tell them you would like to honor them with a salute, a high five, a thumbs up or a Vulcan "live long and prosper" greeting or gesture of appreciation. Elementary schools, especially, are petri dishes of (insert name of current disabling illness here) You should take a moment, between presentations, to scrub your hands. DO NOT touch your face until you do. FYI: What the kids are really after, whether it is a hug or a high five or even eye contact, is the individual attention from you, especially if they have enjoyed and connected with your presentation. Sometimes writers can share this gift with their readers, face-to-face, and sometimes they cannot. All authors have unique styles and presentations. I've decided that the most engaging and interesting presentations occur when a writer is able to do, in front of an audience, what they do so well on the page--tell stories. Connecting with some storytellers or reading up on the subject can help. Do practice your stories so you will get better. You will also learn timing and where the "gasp" moments or laugh lines are the more you tell in front of an audience. FYI: The word, UNDERPANTS is the funniest word in the world to an elementary kid. 1. Often, kids know how a manuscript becomes a book. It is interesting and even MORE fascinating if you tell the story of something exciting, horrible, difficult that happened during the process. 2. Students have been taught how to use a library or how to do research . Share something interesting that happened or that surprised you while you did your research. Where did you go to do your research? Got pictures? Illustrate and explain a specific editing change. If you are lucky you will be presenting in the school library but be prepared for a gymnasium or lunch room-sized venue. Think of those kids at the very back. Can they see and appreciate what you are sharing? 4. Writers of historical fiction sometimes share artifacts or facts from the time period they write about. Share some true stories from that time too. Something drew you to writing about that event or time period, what was it? 5. Have a good time. There is nothing like the energy and wave of enthusiasm that hits you when young readers are hanging on your every word. 6. Finally, know that librarians talk to each other and word of mouth is your best friend. A successful event at one school WILL lead to others. By day, a librarian. By night, the most powerful blogger in kids' books. The community of children's and young adult book bloggers, aka the kidlitosphere, supports their own book awards with their time and talent. Bloggers nominate the books and serve as panelists and judges. The Cybils awards celebrate "the highest literary merit and "kid appeal." The winners for 2009 were announced on The Cybils blog on Monday, Feb. 15, 2010. For great summaries and more information, see the announcement. Purchasing through these links will support the program and help fund these awards. The stereotype about folks who lived through the Great Depression is that they never throw anything away; they reuse foil and twine. They patch and mend clothes instead of throwing them away and harvest fabric from old clothing for quilt patches. 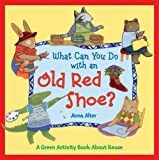 This book suggests many ways to reuse and recycle including ways to use old wrapping paper, t-shirts, crayons, shower curtains, and flip flops in craft projects. It suggests where to share toys that have been out grown and participation in recycling efforts in the community. Even if you do not turn an old shoe into a planter, the book should cause the reader to pause and reflect on our disposable, throw-away society. The Great Depression is never far from my own thoughts as the economy continues to sink below the surface. These projects may come in very handy indeed in the not so distant future. In fact, I think I will go wash and smooth some foil and maybe start a rubber band ball now. Today's NonFiction Monday Roundup is at The Art of Irreverence. I am becoming such a fan of Bearport's nonfiction series books. This volume is part of the No Backbone! : the World of Invertebrates series. The format of the book is very well designed and well laid out for young readers. A nicely sized and very readable typeface is used through out. It has several elements, the table of contents, index, a list of additional resources, that are very useful for teaching information skills. The index terms are highlighted in boldface. Full color photographs of very, very hairy tarantulas are clearly labeled with word balloons and spiderweb shaped text blocks. The information and facts are organized and easy to find. This series group includes Crafty Garden Spriders, Deadly Black Widow, Jumping Spiders, Spooky Wolf Spiders, and Tricky Trapdoor Spiders. I would highly recommend this series for Big 6 or Super 3 research projects and for kids who just love reading about spiders. Nonfiction Monday Roundup is at Great Kid Books. There is always music in Chris Raschaka's work. 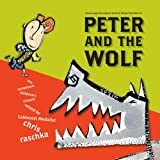 Prokofiev's Peter and the Wolf is often the first introduction children have to symphonic music. Raschka recreates the rhythms and melody lines of the music with his text. Raschka zigs and zags the words and characters across the page as the music moves the story along. Crescendos and rhythms are depicted with upper and lower case letters, as well as, different sized fonts. The reader can hear the oboe and the bird flutter of the flute. Some scenes are framed in a proscenium theater "made of four squares of heavy paper, cut and painted in water color then glued together to make a three-dimensional illustration." The Caldecott medalist's signature style is a good match for Prokovfiev's music. I wish this had come with a CD but the melodies are familiar and easily found if your children do not know them already. Without knowledge of the symphony, this book is not accessible as a straight forward retelling but if you know the music, this is splendid. Now THIS is the way to welcome authors into your school for an author visit! School librarians in Humble, Texas, YOU ROCK! Authors running the gauntlet that I recognize include: Phil Bildner, Susan Stevens Crummel, Matt Holm, and H.J. Ralles. My thanks to Heidi Estrin at the Association of Jewish Libraries for this information on the Sydney Taylor Book Award winners blog tour. The Sydney Taylor Book Award will be celebrating and showcasing its 2010 gold and silver medalists and special Notable Book for All Ages with a Blog Tour, February 1-5, 2010. A blog tour is like a virtual book tour. Instead of going to a library or bookstore to see an author speak, you go to a website on or after the advertised date to read an author's interview. The full schedule for the Blog Tour is posted at the Association of Jewish Libraries blog, "People of the Books," at jewishlibraries.org/blog. Visit these blogs on or after the listed dates to read interviews with our authors and illustrators!